I WOULD LOVE TO SAY MICHAEL AGZARIAN, THE DESIGNER BEHIND THE ‘HOPELESS’ ABBOTT POSTERS, AND I SAT DOWN FOR A COFFEE AND HAD A GOOD LONG CHAT ABOUT HIS PROTEST ART BUT WE DIDN’T. WE NOW LIVE IN AN ERA WHERE YOU HAVE TO GET STUFF DONE QUICKLY, IN BETWEEN EVERYTHING ELSE YOU NEED TO GET DONE. IF YOU WANT TO MAKE A POINT, HURRY WITH IT BECAUSE TOMORROW THERE WILL BE FIVE NEW BLOG POSTS ABOUT IT. BUT THIS IS PRECISELY WHY AGZARIAN’S CAMPAIGN HAS DONE SO WELL. WITHOUT SOCIAL MEDIA HIS BILLBOARD MAY HAVE JUST BEEN A BIT OF CHIPPENDALE GOSSIP... MAYBE SYDNEY NEWSPAPERS MAY HAVE PICKED UP ON IT, IT IS AFTER ALL A CLEVER CAMPAIGN. HOWEVER, THROUGH FACEBOOK, INSTAGRAM, TWITTER AND THE BLOGOSPHERE HIS WORK IS KNOWN ACROSS THE NATION. POSTERS ARE POPPING UP IN VIRTUALLY EVERY STATE THE BILLBOARD HAS MOVED TO MELBOURNE WITH PLANS TO CONTINUE ROUND THE COUNTRY. No one was more surprised by this national reaction more than the artist himself, by provoking a national dialogue, Agzarian’s campaign gained momentum specifically due to it’s engagement with the public, it’s political content and it’s ability to achieve a ‘viral’ status online. By placing art outside of the gallery walls where the public is guaranteed to engage with the work, featuring a controversial figure such as Abbott, you prod the public to engage with provocative ideas. In this case creating a reaction bigger than the art itself. Like many Australians, Agzarian had been increasingly frustrated with Tony Abbott’s “ideologically driven policies” Agzarian aimed to create a piece of art to provoke the public. Already involved with political protest design, Agzarian’s Masters degree centres around this reaction that protest art creates. One of his first examples of protest design started during John Howard’s prime ministership. In rural conservative Australia Agzarian parodied the ‘Make Poverty History’ wrist-bands rebranding them: ‘Make Howard History’. The positive reaction from this first campaign gave Agzarian confidence to pursue a new idea. 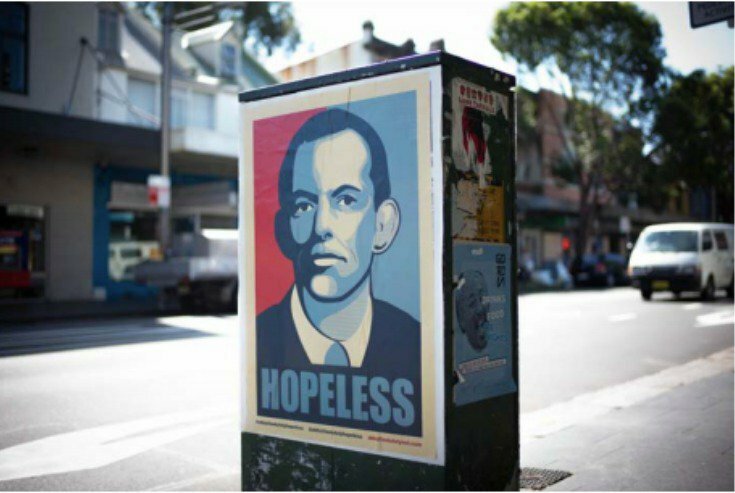 Agzarian appropriates Shepard Fairey’s ‘Hope’ campaign for U.S president Barack Obama in which Fairey used classic American colours to instil the idea of hope to unite a nation which is now an iconic piece of political art, Agzarian has ironically subverted Fairey’s idea of hope uniting a nation to Australia’s ‘hopeless’ political. Agzarian spent months working on an image of Abbott’s face that reflected his feelings of hopeless and provoked frustration for the viewer. He achieved this by depicting a completely apathetic Abbott, with a blank vagrant gaze. Agzarian didn’t want people to pity Abbott, it needed to be an image that got to the point and conveyed this message. Other notorious images of Abbott such as the ‘eating onion’ photo or the ‘kissing baby’ photo have also achieved this ‘viral’ status however, this image Agzarian created aptly connects to a moment of Australian political history that encapsulates the broad public dissatisfaction that is evident in the reaction. The location of the billboard itself, rather than being carefully analysed like the face of Abbott, was a happy accident. Originally it was intended to be positioned above the urban landscape of Ashfield but the space was too big and the image would have had to been resized to fit the billboard. Instead, a spot opened up next to a petrol station in Chippendale opposite The Lord Gladstone Hotel which had close affiliations to the art world and now hosts a gallery: Good Space. I believe this close association Chippendale has with the arts helped promote the campaign and of course the increasing use of social media. The billboard was not only on a main road where people could see it but also at a place where people stop and look for something interesting to look at whilst filling up their car. Once the hashtag hit the World Wide Web it grew and grew, people wanted to donate money to see this image spreading its message across the nation. The fact that Agzarian used his own money to create the billboard instead of funding though a company or political party makes this even more of people’s project. Individuals then raised money to get more posters up and to bring the billboard to Melbourne. The Lord Gladstone actually hosted the auction for the first billboard and temporarily changed its name to The Lord Turnball for the day; they continue to sell the posters there. I asked Agzarian whether his grand plan was to provoke a national reaction but as he wonderfully put it: “We all have a choice to make [our] voices heard to the masses. I just wanted to put my message out there not just as a political protester but as a designer. You always want to create something that will provoke a reaction; something to be remembered.” Agzarian told me the National Library has archived the poster into their political art database, and requests have been coming in to do talks at art school about creating successful political protest design. I think Agzarian may be on his way to this status of mass recognition most artists covet. This really has become a people’s piece of art, with images all over social media and people reworking the poster to add their own personal frustration with Abbott. The reaction to Agzarian ‘s work is morphing in its online existence as ‘memes’ are changing the meaning and can be seen all across the internet. Take the example of Abbott tucking into a raw onion, this image went viral with people reworking the image and the video adding their own songs and creating their own stories about the bizarre incident. This is where we can quantify the impact of political art; when it offers a means for the public to critically evaluate politics, opening discourse of dissatisfaction. He has successfully created an outlet for the general public to express political frustration; despite the viral ‘meme’ nature of the work it is important to recognize that this is art; and for art to be taken seriously it needs to have a message that is communicable to all walks of people.